Changing the landscape of education and the services provided to students, Superintendent Dr. Art Cavazos is a nationally recognized leader with almost 30 years of experience in education. Since being named Superintendent at the Harlingen Consolidated Independent School District in November 2013, he has taken on many leadership roles to further public education. Most recently, he was appointed to the Legislative Council of the University Interscholastic League (UIL). In 2016 he was selected by Governer Greg Abbott to serve a five-year term on the State Board for Educator Certification to help advance the work of education in Texas. Dr. Cavazos serves on the Future-Ready Superintendents Leadership Network, University of Texas College of Education Advisory Council, and FIRST in Texas Board whose members are some of the most notable and respected community and business leaders from around the state. He is a member of the University of Texas' Cooperative Superintendency Program Executive Advisory Committee where he shares his insight and experience for the benefit of doctoral students as they prepare for their future roles as executive leaders. Dr. Cavazos was recognized as the Region 1 2017 Superintendent of the Year, as well as Texas PTA’s 2017 Superintendent of the Year. In 2016, he became the recipient of the National Speech and Debate Association Gulf Coast Communicator of the Year Award. He was awarded the 2014 Distinguished School Administrators Award by the American Association of School Librarians for his efforts to advance library and literacy services. He is the second administrator from Texas to earn the national award. Before receiving the national award, the Texas Association of School Libraries named him as the recipient of the Distinguished Library Service Award for School Administrators. He was also nominated and is certified to serve as a mentor for new superintendents in the State of Texas. In November 2014, it was announced that he was selected by the U.S. Department of Education as one of 100 top school leaders from across America to participate in the first-ever National ConnectED Superintendents Summit at the White House. The unique conference brought together officials from throughout America to share with one another, and the Education Department promising approaches to using technology in classes. He led HCISD through Strategic Planning, which involved over 800 community members. The district's strategic plan was adopted by the Board of Trustees in February 2014 and will continue to set the path for student achievement for the next three to five years. With the plan containing a focus on developing the four C's (communication, collaboration, creativity and critical thinking) within students, there will be an emphasis on early childhood literacy to create the path toward elementary, secondary and higher education success. He was influential in the calling of the Tax Ratification Election, which was approved by the Harlingen community in September of 2015 and is allowing the district to address facility needs through replacements and upgrades without incurring debt. Most recently, he has brought robotics to scale with the implementation of HCISD Robotics, an initiative to bring authentic learning experiences to students in the field of STEM (Science, Technology, Engineering, and Math). Setting his sights on the future of education he has set the course for a full Career and Technical Education redesign to create meaningful pathways rich in authentic learning experiences through dedicated academies for students in areas like health services, apprenticeships, media, arts communications, nursing, and teaching. As an educational leader, Dr. Cavazos’ mission is to provide students and parents with educational choices. It was a mission that was kicked off with the creation and opening of Early College High School in 2007. Continuing his efforts toward providing the HCISD community with Schools of Choice, he played an integral role in the development and opening of the Dr. Abraham P. Cano Freshman Academy in 2013, the Harlingen School of Health Professions in 2014, and the Aquatic Center in 2015 which provides water safety education (SEAL program) to second-grade students districtwide. Before being named Superintendent, Dr. Cavazos served as the district’s Interim Superintendent and Deputy Superintendent for Transformation and School Support. During that time, he was instrumental in leading the district’s transformation. These components of transformation include the digital classroom initiative, implementation of Dual Language Academies, transforming the libraries into Information Literacy Centers (ILC), and the implementation of campus Internet Cafes. He joined HCISD in 2001 as the Assistant Superintendent for Secondary Education where he supervised the overall secondary school community and provided leadership to principals and directors. Additionally, Dr. Cavazos provided leadership in the planning, designing and opening of new campuses and remodeling existing schools. Beginning his career in education as a math teacher in the Edinburg Consolidated ISD in 1987, he moved to McAllen ISD in 1990 where he was employed as a math teacher, counselor, and principal. In 1996, he worked as the Director of Secondary Education in the Mission Consolidated School District where he led efforts in high school redesign and supervised secondary principals. Collaborating with education and community leaders to advance public education across Texas, Dr. Cavazos has served as an honored speaker at a recent Texas Lyceum event, Educational Technological Leadership Conference, American Association of School Librarians National Conference, and Texas Association of School Administrators Midwinter Conference the last several years. He also regularly presents at local organizations and clubs districtwide. Dr. Cavazos is a Valley native who entered the University of Texas Pan-American in 1987, where he received a Bachelor of Science degree. In 1990, he received a Master of Education degree with a Counseling and Guidance major. During the following years, he earned a Mid-Management Certificate, Superintendency Certificate, and, most recently, his Doctorate in Education from the University of Texas, Austin in April 2012. 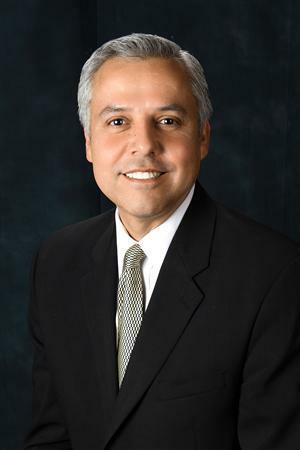 In addition to his professional accomplishments, Dr. Cavazos is active in the community. He serves on the Boys and Girls Club board, Su Clinica Familiar Board, South Texas Emergency Care Foundation board, the UIL Legislative Council, and the local UIL Executive Committee. At the State level, Cavazos served on the UIL Waiver Review Board, State Academic Achievement Distinction Designation Committee (AADDC), the Texas Association of School Administrators Leadership Advisory Committee and Leadership Development Committee, Ford Next Generation Superintendent Council, and the Texas High Performance Schools Consortium. He’s a member of the Rotary Club, Boy’s Scouts of America, and St. Alban’s Church. He has been married to Sharon for over 20 years and has two boys, Christopher and Matthew.